Ever dreampt of having your own private family compound with arable fields, livestock pastures, wooded areas and rolling lawns ? This rare opportunity to acquire all of this exists now but won't be around for long at this new price ! Suitable for the construction of up to 3 detached dwellings, this rectangular shaped lot of just over 10 acres runs all the way to the ocean and boasts over 500' of coastline. 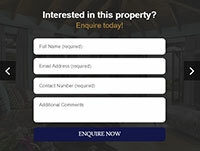 For further information and a tour of this exceptional property please call us on[tel. no. redacted]. Agent Name: Crisson Company Ltd.